I stopped by my brother’s house on Saturday to pick up my empty Tupperware containers. The rule is….if I get them back, I fill them up again. I love to make soup and they love having homemade soup for lunch, so it’s a no-brainer. My oldest nephew was in his car behind me and we pulled into the driveway at the same time. After most of the family had an appropriate amount of time to make fun of his morning hairdo, I headed to the grocery store to get all of the ingredients for the three soups I was making that afternoon. I was just about home when my phone beeped with a text message. It was from my nephew asking if I had dinner plans for the evening. His parents were going out for the night and he wanted to make something nice and have me join the two boys for dinner. I have written two previous blog posts titled, “Boys will be boys and then they make you cry”. I’m sure you can surmise what happened next. Yes, the tears appeared at the thought of a 17-year old boy not taking advantage of an empty house to have his friends over. 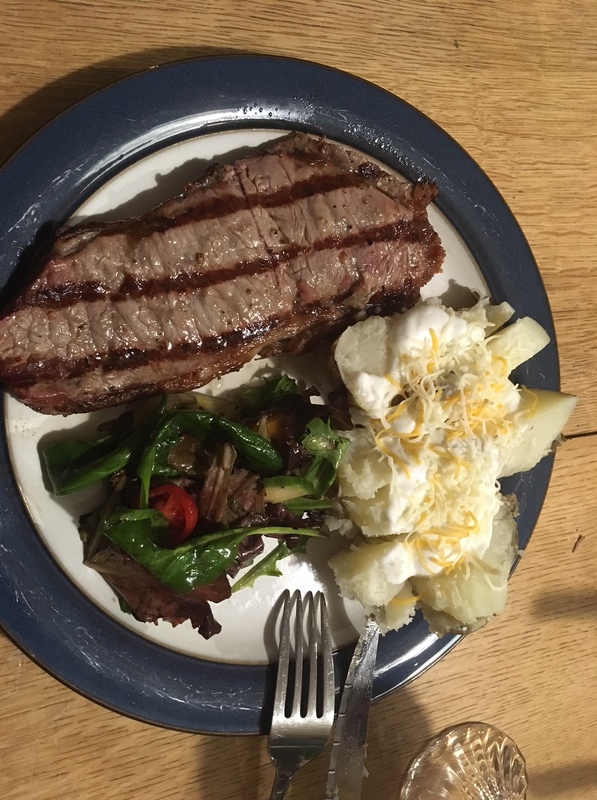 Instead, he made steak, baked potatoes and a salad for his Aunt and his brother. Suddenly, the dynamic of boys being boys was replaced by a dinner that the three of us enjoyed and gave us time to catch up. There were no sibling shenanigans, my older nephew cooked, my younger nephew cleared and stacked the dishes in the dishwasher and I sat staring at these two faces who seem like they should still be seven and four, not seventeen and fourteen. In a world where the character of some children can be questionable at best, I sat in awe of the two young men sitting with me at the dining room table. To say my brother and sister-in-law got it right is an understatement and I am so proud to have these two young men in my life. Now, if you’ll excuse me…..I have something in my eye….again. I like your rule. We have lost so much tupperware through the years. The promise of filling them up again certainly makes the return much easier. Those are the precious moments in life..I recently had the opportunity to go out for a girls’ lunch with my nieces, (all who have families of their own now), and my sister.. just looking at the young women they have become made my eyes tear at the table! And you’re right – wasn’t it just yesterday they were 5?? Time really does go too fast! That is so lovely. What wonderful guys. It speaks to how wonderful you must be too, though, that they wanted your company and even put work into the evening. What a good auntie you must be! What a great story, Susan. I think they learned from your example…nice job!